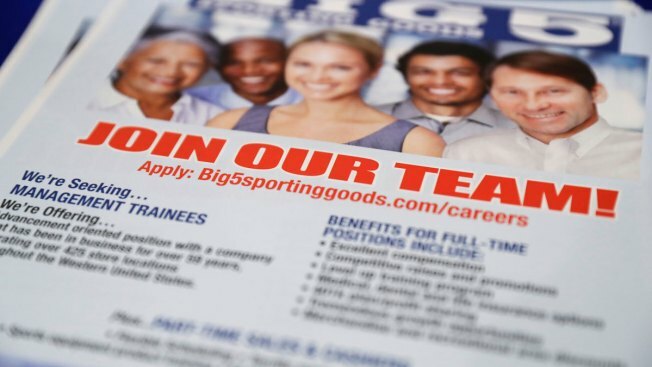 In this Thursday, Aug. 24, 2017, photo, a flyer advertises job openings with Big 5 Sporting Goods during a job fair in San Jose, Calif. On Thursday, Aug. 31, 2017, the Labor Department reports on the number of people who applied for unemployment benefits a week earlier. More Americans applied for unemployment benefits last week, but the numbers remained low and consistent with a healthy job market. The Labor Department says 236,000 people filed claims for jobless aid, up from 235,000 a week earlier. The less volatile four-week average slipped by 1,250 to 236,750, lowest since May. Unemployment claims are a proxy for layoffs. They have come in below 300,000 for 130 straight weeks, the longest such stretch since 1970. The low level suggests that companies are confident enough in the economy to be hanging onto staff. The unemployment rate is at a 16-year low 4.3 percent, and employers last month added a healthy 209,000 jobs. The number of Americans collecting unemployment checks fell slightly to 1.94 million, down 9.5 percent from a year ago.